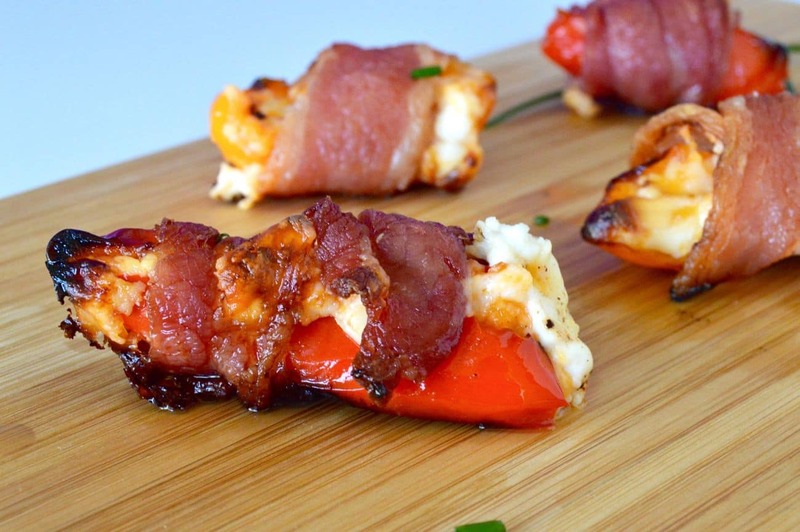 Bacon Cheese Pepper Poppers hit on all cylinders. They are tender, juicy, filled with melty cheese, wrapped in bacon with the sweetness of the peppers. Perfect for a BBQ or any get together! Bacon Cheese Pepper Poppers are a perfect choice for a get together where you have people who are eating low carb or gluten free. And noone will miss anything if you serve this. The cheese is melty, the pepper stays really succulent and the bacon gives it the salty/crunch that make you want to keep eating more of these. Im trying to eat less carbs and it seems like a LOT of people I know are too. Trying to get a high amount of protien in my diet at the same time can be challenging. I really crave crunchy potato chips. I mean really crave. 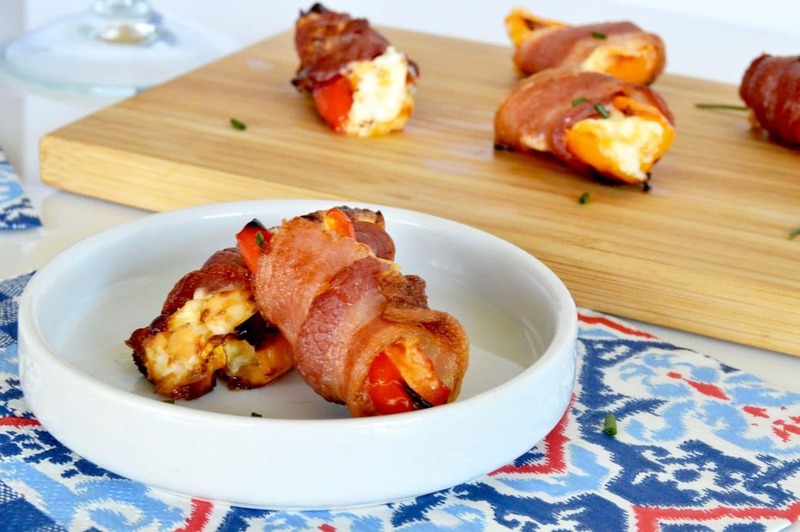 But this recipe for Bacon Cheese Pepper Poppers allow me to eat with my guests because its so full of flavor while still hitting the low carb needs of so many of us. 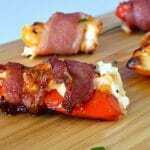 Secret trick to get the full flavor taste, yet cut down on calories in these Bacon Cheese Pepper Poppers? Easy/Hard: This recipe is super easy. Scooping out the seeds of the peppers is probably the hardest thing about the recipe. See? Thats not even hard! Make Ahead Prep? Absolutely. You can make these a day ahead and then cook them when your guests arrive. They will be salivating when they smell the bacon cooking. Cocktail Suggestion: The next time I make these I’m going to make them with a Bloody Mary and use the Bacon Cheese Pepper Popper as an add-on to the drink! They would also go well with Beer or wine for a Football watching party. Lastly, they would go great with the Saki-tini… a mixed drink that would really pair well with the bacon and Cheese in this appetizer! SEE DIAGRAM IN POST FOR PICS OF STEP BY STEP INSTRUCTIONS!! Rinse peppers, cut of tops then cut in half lengthwise. Scoop out veins and any seeds, set aside. Mix cream cheese and cheddar cheese until well blended. Roll cheese mixture into nickel size balls (see photo), set aside. Roll each piece of bacon to almost double its size. Cut bacon in half both lengthwise and then cut that in half width wise. (see diagram) Each piece of bacon will give you 4 pieces of bacon for 4 different peppers. Place cheese ball into pepper half and press cheese into all parts of the pepper. Then wrap one piece of bacon around the pepper. Grill at medium heat while watching the entire time, about 15-20 minutes. You must watch the entire time and make sure the grill doesn't flame up and burn them. Move them around to avoid any hot spots. Grill until bacon is crisped and browned and cheese is melty. Alternatively, bake in a preheated 400° oven for 20-30 minutes or until bacon is crisped and cheese is melted. Nutrition information was calculated in My Fitness Pal using ingredients I used specifically to make the recipe. Please note using different brands/ingredients affects the caloric information. If you are following a strict diet, please plan the calories using the ingredients you use. « Steak Tartare and its storied history! Love these as an appetizer, but they’re also a great snack all on their own. Perfect starter for any party! Bacon is always a good idea..
My OH is a bacon fanatic and loves chillies. I think I would make these with the small mild chillies instead. Oh my!! Thats a fabulous starter. Beautifully done. …you had me at bacon! This recipe looks so simple to assemble and absolutely delicious! I’d need some serious self-control because I could easily eat the entire batch! Look at that beautiful charring on the bacon and cheese! To be honest, if I am swapping carbs for bacon, who needs carbs! I like the way you think! And I completely agree!